You can sign the kids up for sports programs at the local community or recreation center. You can take evening walks around the neighborhood. 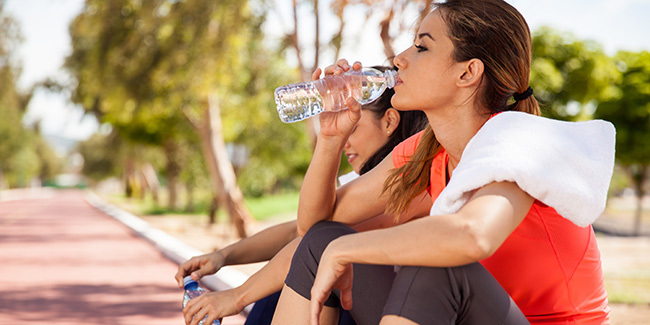 Don’t try to workout or do a lot of strenuous activities in the midday heat. School’s out. Things are slow at work. And the warmer weather brings lots of new opportunities to improve your health: plenty of fresh, local produce and more choices for outside activities. Here’s how to make the most of the summer months. “When the weather is nice, there are more opportunities for getting outdoors and having fun with your family and incorporating exercise into day-to-day life,” says Dr. Susan Yanovski, co-director of the Office of Obesity Research at NIH’s National Institute of Diabetes and Digestive and Kidney Diseases. “Summer is a great time for getting out and increasing activity, if done in a safe fashion,” agrees Dr. Marie A. Bernard, deputy director of NIH’s National Institute on aging. There are almost endless choices. Take evening walks around the neighborhood. Sign the kids up for sports programs at the local community or recreation center. Go swimming together. Ride your bike or take a hike through a park. Plan a family softball or soccer game. Just make sure to exercise a little caution. Heat is the biggest danger in the summer months. Being hot for too long can cause many illnesses, some of which can be deadly. Older people are at particularly high risk for hyperthermia because the body’s ability to respond to summer heat can become less efficient with advancing years. Look out for the warning signs of hyperthermia, which include headache, nausea, dizziness, muscle spasms and fatigue. If you suspect someone is suffering from hyperthermia, get the person out of the sun and into a cool place. Offer fluids, preferably water. Urge the person to lie down and rest in the coolest place possible. Encourage them to shower, bathe or sponge off with cool water. Heat stroke is an especially dangerous form of hyperthermia. It can be life threatening, so you need to get medical help right away. A person with heat stroke has a body temperature above 104° and symptoms such as confusion, combativeness, bizarre behavior, faintness, staggering, strong rapid pulse, dry flushed skin, lack of sweating or coma. 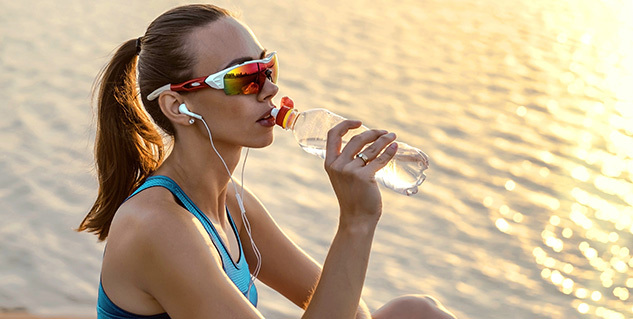 To avoid hyperthermia, don’t try to exercise or do a lot of strenuous activities in the midday heat. And make sure to drink plenty of liquids. Another potential danger comes from the summer sun. “It’s a time of the year when the sun’s intensity is greatest,” says Anne M. Hartman of NIH’s National Cancer Institute (NCI). Exposure to ultraviolet (UV) radiation—invisible rays that are part of the energy that comes from the sun and artificial sources like sun lamps and tanning beds—is strongly associated with skin cancer. To protect yourself from those UV rays, Dr. Frank Perna of NCI cites the catch phrase “Slip, slop, slap and wrap”—slip on a shirt, slop on sunscreen, slap on a hat and wrap on sunglasses. Slip on protective clothing. Choose shirts with long sleeves and long pants to protect as much as your body from the sun as possible. Many modern fabrics are light and breathable yet protect your skin from the sun. “A good rule is if you can see through the clothing, UV can pass through it and it will not provide you optimum protection,” Perna says. Some clothes are now marked with an “Ultraviolet Protection Factor” or “UPF.” UPF measures the amount of UV radiation that can penetrate the fabric. For example, a UPF of 50 means that it allows only 1/50th, or 2%, of UV to pass through it. Slop on sunscreen. It may help prevent skin cancer, although sunscreen can’t replace avoiding the sun during peak hours, staying in the shade and wearing protective clothing. Look for sunscreen with a sun protection factor (SPF) of at least 15. Those with an SPF of 30 or higher will provide the most protection. Right now, unfortunately, SPF only measures protection from UVB rays. “Since both UVA and UVB cause damage to the skin, you should use a broad spectrum sunscreen, one that contains ingredients to protect against both UVA and UVB,” Hartman says. The U.S. Food and Drug Administration has proposed a set of regulations for rating UVA protection. For now, those product labels should at least mention UVA protection. And finally, wrap on sunglasses. The label should say that the lenses block at least 99% of UVA and UVB radiation. Now that you’ve got yourself covered, you can get outside and get active. There are more locally grown fruits and vegetables. “You can have fun trying what’s seasonal and tasty,” she says. And stay away from the food table so you’re not tempted to eat things you’d rather avoid, she says. Something else to think about in the heat is keeping foods cool to avoid food poisoning. Microbes can grow quickly in food that’s left out for too long. With some planning, you can enjoy the opportunities that summer brings and avoid the health risks.